Today, we’re proud to announce the launch of Elementor Blocks, the new crazy-fast way to create websites! 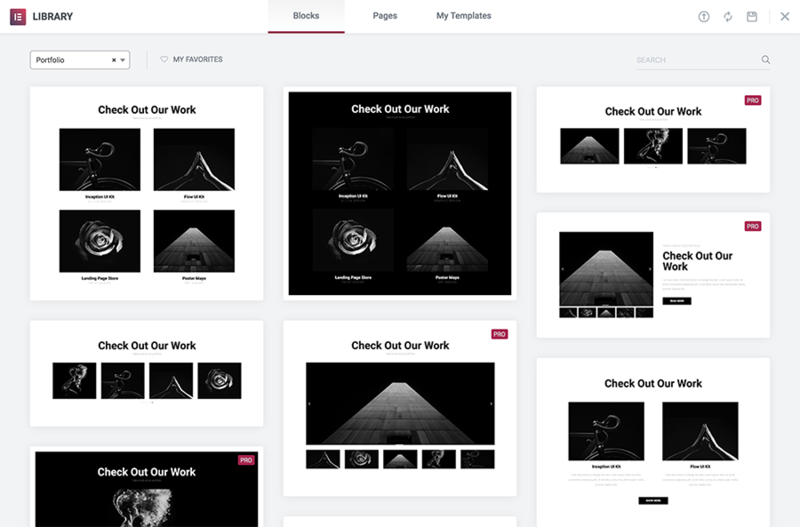 We are thrilled to introduce Blocks, pre-designed section templates that can be easily combined to create a complete & beautiful website or landing page. Think of Blocks like Lego bricks. You pick the relevant blocks – start with the hero, services, a testimonial and the other parts of your page, then customize each one to make it fit your website. Working with a full page template is great, but sometimes you don’t want the entire page to be preset for you. With Blocks, you get the convenience of pre-designed layouts and the flexibility of picking and choosing each section. Need a hero section? Maybe testimonial? Sort through the list of relevant blocks, and find the one that best fits your needs. We’ve identified and categorized all the different elements of a page, and provided you with a wide array of blocks. When you click on ‘Add template’, you will see the Blocks tab. Here you can browse and filter through the different available blocks, choosing the one that you need. Instead of starting with a blank section, you can pick a block to fill your section with content. Then you can customize it and make it your own. Each block is built with simplicity and independence in mind, making the task of fitting the different blocks together much easier for the user. Blocks are not just a new feature, they present an alternate workflow that can be useful for beginners just learning the ropes of Elementor, as well as for professional web designers who create websites for a living. For beginners, it enables them to create what they want – Beginners sometimes lack the experience required to create a needed part of a page. They know their landing page needs a contact form area, they just don’t know how to build it. With Blocks, it’s just a matter of picking the right block, inserting it and tweaking the content a bit. For professional designers, Blocks enable a faster workflow – Blocks are simple and independent. This makes it easy to combine different Blocks together. Once you add a certain Block, you’re able to easily duplicate, drag, delete or modify the Block however you like, without it affecting the other sections of the page. Using Blocks can have a real impact on your workflow. This Create > Build > Customize > Save > Reuse workflow is an ongoing process that can be optimized to empower you as a web designer, enabling you to complete far more projects in much less time. We built a huge array of designer-made Blocks, covering just about any needed section. There are no less than 235 different Blocks available in Elementor, spread across 15 popular categories: Header, Services, Contacts, Price, Team, Testimonials, Portfolio / Gallery, Clients / Friends, About, Call to action, FAQ, Progress Bar, Countdown, Subscribe, Forms, Footer, Features. We included both dark and light types of Blocks. This is crucial since you can adapt a dark Block to a dark themed website with a simple background color change and a few minor tweaks. Search for what you’re looking for and pick the best match. In the future, the Blocks library will also include category filters. Work smarter, not harder. Start using #elementor Blocks, and build websites crazy-fast! Blocks are the first feature release of Elementor 2.0. If you missed it, be sure to checkout our 2.0 roadmap. Next month, we’ll be releasing the Header Footer feature, giving you control of the header and footer design, which up until now was static and came from the theme. As we release more and more features of Elementor 2.0, Blocks will become more relevant, since they will be used to create dynamic content. Which Blocks would you like to see? Go over the list and let us know in the comments which Blocks you would most like us to add. You guys keep wowing us. Yet another great update. Fantastic, that’ll make sites quicker to put together. I use Elementor Pro for all sites now, it’s just the best! This really looks promising. What i am missing at the moment is a way to seamlessly integrate a 360 panorama picture in my site. Don’t know if you should consider this a block or maybe a widget. Wow, this is great, it’s amazing how much you guys are constantly improving! Another amazing feature that’s very practical and will save a ton of time when building or revamping websites. You guys are awesome! Awesome stuff Ben. You guys are way ahead of the competition! Keep it up!!! Very nice, thanks for this. Super excited about incorporating this! Incredible … the block I would like to see would be instagram in real time as in the case of facebook, this is a dream of consumption that I expect in Elementor. But congratulations on the beautiful work, you surprise every launch. I use google translator to type, sorry if English is not perfect. Save us tons of time. Can’t wait for sticky header, yay! Uh, so is this blocks concept compatible w/ Gutenberg, or you’re rolling your own with the same name here? It’s our own, but with the idea that Gutenberg Blocks are definitely planned. Best to think ahead and consider compatibility, right? Honestly guys, I’m a Webdeveloper since I did it as a part time job during my university time. I coded entire pages in php, wrote countless lines in java script and created themes for various CMS. But thanks to elementor my job became so much more fun, I’m glad I found it and see people displaying a high level of skill and love for their craft & product. These look absolutely incredible, and I’d love to get my hands on them ASAP to start creating! I’ve submitted my e-mail for participation in the open beta, but haven’t yet received an e-mail with the plugin download. Are e-mails sent out at specific times throughout the day, or is it an automated process? You can activate the beta version going to the Elementor menu in the WordPress dashboard, click on Tools and then go to Version Control, finally enable the option of Become a Beta Tester and you’re done. Wait until the update appear into the dashboard, update to the 2.0 version and enjoy. You should switch on beta testing in the Elementor dashboard > Tools and you should get the update. Love it! Now that it is officially released, can it be used on development/build site domains now? Just had a peek at the blocks. I think some contactform blocks would be a real improvement. Thanks for a greatnew version. So cool! Can I buy stock in your company??? what is the difference between blocks and sections? Super excited to try this new feature!!!!!!! Simply amazing and great value! Keep up the great work! Gutenberg blocks, Elementor Blocks, well played! + Sticky FOOTER (just like sticky Header but stays visible at bottom of window). + Image slider gallery with a text area UNDER the big image & thumbs!! This is needed for my pro artist and photographers sites who never want anything on top their art work. THX!!!! Sticky elements should come soon enough. Regarding the image slider you mentioned, you might use a dedicated slider plugin in the meantime. Great next step for Elementor! Have been thinking of something like this for some time now, so it ‘ll be great to try it out! I almost chuckled because I thought this was going to be a post about compatibility with Gutenberg, but instead… nothing. Are the blocks for Pro only? I already have the elementor plug in? is this a new one? I am so happy that this is available, i was about to leave blue host for not having a drop program that was worth. Hopefully blocks will reduce time to save a page. You can do this with custom CSS! Google WordPress plugin sticky header- supereasy! A great new feature! I built up my own library in the past by saving different website parts as elementor templates … but with BLOCKS I now have a larger variety and will save a lot of time. Thank you! Ben, I’ve been feeling very relieved I picked Elementor over BB recently, and then you do this… Holy Website Heaven! This will make all my design layouts unbelievably fast now! I have been messing around with the full 2.0 beta as well and I just want everyone to know at Elementor how absolutely amazing this product is! For someone who is very design oriented (not super code guy) this system is perfect. Thank you for all of your hard work. This is amazing to read. Thank you! Ben, can you please explain the difference between blocks vs sections vs templates? . Of course! Import-export is easy and fast with Elementor, and is also available for Blocks. Congrats on the new release, it is awesome! Congrats… Tyler at Tyler.com has had something for Elementor similar to this going for a while. Dunno if you guys got the idea from him. If you did, please attribute! We are in close contact with Tyler and love his work, but Blocks are our own creation so I really don’t appreciate your comment. Re: Stickry Footer… You’re right Alexander! THX! ben – i want to use on on my local server to try and test but it says i need to activate pro… which i cant do because its on my live site. any suggestions? I’m no expert, but it seems to me that a Block would contain several Sections. Your new releases are always awesome (and for very useful functions too). Blocks will save folk a ton of time and help keep layouts / designs consistent. Here’s a feature that I’d love to see: to be able to set a template up as a series of block that is some case can or cannot be removed or moved by a user (depending on the role and permissions), and to be able to lock the design of the blocks (if that’s not the case already). You guys have revolutioned the wordpress and web design world. Nothing is the same since Elementor. Can’t wait to use blocks in our web designs!!! Wow! That is an amazing new feature! I just bought Pro version. No words to describe …… Keep going….. You have a new fan now! Ben, I discovered Blocks last night and already love the concept. It will make designing web pages so much simpler and faster. Great work! omg! This new blocks feature is flipping amazing!! Absolutely worth every penny to pay for pro! Thanks. Looks good. I’m signed up for this. Have Pro, too. Activated everything. Should these blocks be showing up in the editor now? Do I need to download something else? This is not a top priority right now, and probably won’t be available any-time soon, but maybe in the future. And again a really great step forward. It’s unbelievable how Elementor accelerated my workflow. Only one anoying thing using Blocks and Templates. My media gallery is populated with many pictures. Is there a way to prevent this? You can preview the template before using it. Once you insert it the templates have images so they are added to your media library. @Ben: is a third party template/theme (like Astra/Ocean etc) still needed with your fabulous Blocks to create a complete website? Or do I have to wait then for the next update when header/footer will be introduced in Blocks? Keep up the good work! After the killing of Muse by Adobe I’ll move over to Elementor. Will it give me traffic. i have a web site but its stuck no income, no traffic. do you have any idea for that, i need help please. Excellent news! Is there any way to add elements to those blocks? For example, in the pricing table I need two buttons for Mac and Win versions of each pricing column. For now you can use something like https://wordpress.org/plugins/wp-quiz/ and incorporate it into your WP / Elementor page if it has a widget of some kind to import. I have a problem when I use Elementor for design my posts. If I do it with Elementor the “read more…” doesn’t work, the post appear at the home page without it, complete. That is a problem for me. If I do it with every post I make, the home page will be huge. And this is not a possibility to me. What can I do? There’s a solution to this? By naming them Blocks, you’re inviting confusion with Gutenberg pending. I believe Elements is a better description and fits perfectly with Elementor branding. Isn’t saving a row basically the same thing? Looks fantastic! Could definitely use a real-time Instagram block if you’re taking requests. Preferably clean with a quantity option starting at 1 for thumbnails. Thanks, brilliant work. Amazing! Maybe the dynamic fields capability is now the last thing missing to me to adopt Elementor in 100% of my projects! Looking forward to see it working! Hey there. Perhaps I am missing something (apologies, the thread of comments is too long to read) — but are you thinking of adding an option to save user’s own blocks? One thing that I sometimes struggle with at the minute is that I cannot easily save multiple rows into one widget. That’d be super handy. Thanks. Looking forward to compatibility. I will certainly build all my clients and important platforms around Gutenberg. I’m an artist by trade (not Techie) and got very frustrated with using templates to create my first WordPress website. Found Tyler and started using Elementor was so impressed with it I upgraded to Pro. I must say I created one CREATIVE website that is getting a lot of compliments and response from customers, THANK YOU ELEMENTOR for a FINE product, can’t wait to start using Blocks on my other new websites and most definitely looking forward to the Header/footer release. Wish Elementor worked with themes in Shopify! Keep up the great work, a real BLESSING to us artist! I’m looking forward to getting my hands on this in the next few weeks. You guys are awesome! Ohoo! This is awesome, I see that, the blocks are goign to update on every niche business soon. I’m sure there will be a huge list of blocks in couple of months. Can you make blocks on the personal branding pages too? I think I’m missing something. I updated Elementor via WordPress and I don’t see any option for Blocks. I created a new template and still nothing. I’ve been using Elementor for awhile now on quite a few websites and the idea of Blocks is very appealing. What am I missing? Which Elementor version do you have? first, it’s great to work with Elementor! Great job! Is there a way to build my own Blocks? As blocks can consist of more than one section, it wold be great to create my own blocks. this is very nice and readable post. its very knowledgeable and informative blog thank you for sharing with us. Well done! BLOCKS are a brilliant, simple concept. For me, they are a fantastic extension of ‘My Templates’. I don’t yet see a ‘Table’ or ‘Simple List’ Block. I use elementor pro and is the best way to have an awesome website. Nice post really helpful. Recently discovered it and love it!! Do you have a live demo of those blocks? Is there an easy way to print out the Blocks available – I would like to discuss with clients when planning the website layout? Elementor is the best page builder. Is it possible “lock” certain blocks of the page for Editing based on User Role? Suppose, I have a Contact Us block where where I’ve inserted Contact Form 7 shortcode, which I don’t want the Users with Editor Role to mess up with. I see the Role Manager allows me to control the ability of adding new blocks/editing existing blocks. But I don’t see a way to lock only a certain blocks on the Page, or am I missing something? Love Elementor and the updates and upgrades just keep coming! Thank you for making our lives so much easier! what great templates, thanks for sharing this. I just love it. great templates I like it.. This is really awesome article.